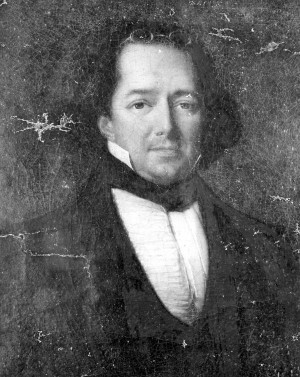 During the early phase of the Second Seminole War, and for the previous three years, a lieutenant colonel of Florida’s militia and sometime aide to Brigadier General Richard Keith Call, was enrolled under the impressive name of Achille Charles Louis Napoleon Murat, Prince Royal of Naples and Duke of Cleves. It is hard to imagine a man with such a name leading Florida frountier militia into the wooded wilds and swamps of the central part of the territory, but he did. Achille Murat was the eldest son, and heir, of Joachim Murat, Grand Duke of Cleves and Berg, King of Naples, Marshal of France, and Caroline Bonaparte, Grand Duchess of Berg and Cleves, Queen of Naples, and the youngest sister of Napoleon Bonaparte, one-time Emperor of the French and conqueror of Europe. Achille’s early life as part of the French imperial family surely did not suggest his later life on the Florida frontier. Born January 3, 1801, in the Hotel de Brienne in Paris, and partly raised in a palace in Italy, his early life was one of ease and privilege. Following the downfall of Napoleon and the death of his father, he and his family were exiled to Austria. After receiving permission from the Allied Powers, Murat emigrated to America. By 1823, he was a resident of St. Augustine with a small plantation outside the city. He was a member of the local enrolled militia and, briefly, a volunteer under Brigadier General Joseph Hernandez, a personal friend. However, finding East Florida unsuitable for his plans, he purchased a plantation east of Tallahassee and, except for brief forays to Belgium, New York, and Louisiana, here he lived and eventually died. His plantation was called Lipona, the name an anagram for Napoli (Naples), the kingdom he was reared to rule. Following the 1830 revolution in France, Murat returned to Europe and was briefly a colonel of the Belgian Foreign Legion and a colonel he remained the rest of his life – in Florida’s Militia. While in Belgium and France, he had hoped to regain some part of the fortune that he believed should be his based on the properties of his parents. He was to be disappointed.